The Brooklyn Spread the Light Club was set up as an organization devoted to the discussion of economic questions, open to anyone ‘above the age of 16 engaged in useful or honorable employment’. One of its objects was ‘to aid in the circulation of reform literature viz. the Irish World, and the Volks Zeitung and such pamphlets as are best calculated to disseminate the knowledge of true political economy and to counteract the pernicious influence of literary poison from the daily press’. Rooms had been hired for weekly lectures ‘on the vital questions’, a library would be provided, but party politics was to be tabooed. It would be, it was hoped, an excellent opportunity for ‘workingmen to gather and discuss grievances and their remedies’. The rooms hired were on the fourth floor of 365 Fulton Street and would become the ‘Spread the Light Hall’. The first meeting of the club took place in December 1880. Henry George, the economist, then relatively unknown but soon to be feted and influential, delivered the inaugural lecture. 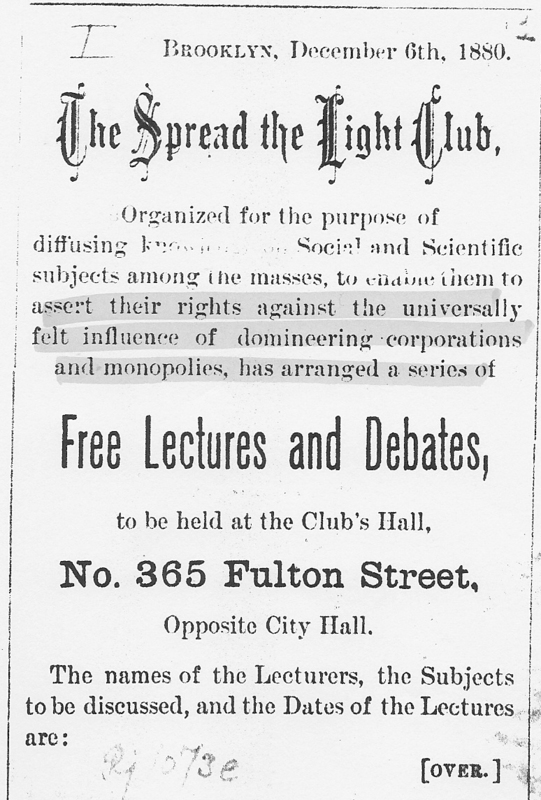 The Club had announced that it had been ‘organized for the purpose of diffusing knowledge on social and scientific subjects among the masses, to enable them to assert their rights against the universally felt influence of domineering corporations and monopolies’. The invitation to the lecture, the first of a program of free lectures, had been to ‘workingmen and land leaguers’. The Brooklyn Eagle’s report noted that it was a ‘Sunday Socialistic Meeting’, entitled ‘Spread the Light’, and that it provided ‘Radical Views on the Land Question’. The term ‘Spread the Light’ – which had been heavily used in the Irish World’s campaign through 1880 in support of the Irish Land League – had taken on a more general significance, particularly among socialists – and expressed the view that what was needed to mobilise labor against monopoly was to ‘Agitate, Educate and Organize’. The organization of the Club was not easily apparent to the public eye. Non-hierarchical, it did have a committee though the membership of that was fluid. Some of the dominant figures were active in Brooklyn’s Local Assembly 1562 of the Knights of Labor, notably Theodore Cuno, Matthew Maguire (who, as with all organizations he joined at this time, was secretary), and the ritualist Master Workman William Horan. However, through these men and others, the Greenback influence was strong, there were socialists, and there were those who would have claimed to be both or, on occasion, neither. By the following March, the Club had, in effect disappeared, at least in terms of its original scope, function and presence, though the term ‘Spread the Light’ stuck for some time to the Hall at Fulton Street, and to the LA 1562 pseudonymous organization, the Advanced Labor Club. This entry was posted in Media, Organisations, People, Places and tagged "Volks Zetung", Brooklyn, Cuno, Henry George, Irish World, LA 1562, Matthew Maguire. Bookmark the permalink.